Dian Fossey and Jane Goodall are household names for their groundbreaking research on apes. They’re often mentioned together, given the similarities in their lives. Both women ultimately dominated their fields, despite lacking formal scientific training in their early lives. At a young age, both felt driven to explore the natural world, self-funding their initial trips to Africa. These early excursions both drew the attention of Louis Leakey, a Kenyan paleoanthropologist who helped launch their long-term studies of primates. Now, their inspiring lives are getting renewed attention in two new documentaries that not only document their achievements, but the complicated and contrasting paths they took to get there. But the contrasts between the two biopics, in their content and style, echo the stark difference in the two queens of primatology, how they approached conservation and the species they studied, and how we remember them today. “Dian Fossey: Secrets in the Mist,” which premiered Dec. 6 on the National Geographic Channel, resembles an Unsolved Mysteries-style murder drama. While the reenactment-heavy documentary doesn’t skimp on spotlighting Fossey’s discoveries, it’s driven by Fossey’s final (and brutal) encounter. Fossey was found dead in her cabin at the Karisoke Research Center in the mountain rainforests of northern Rwanda, two days after Christmas in 1985. Her head was covered in blood; her face split open by a machete. Yet Fossey’s passport, handguns, and several thousand dollars in cash and traveler’s checks had been left untouched, raising the suspicion of investigators. The first episode of the documentary opens with a recreation of the attack, while the third and final installment ends by trying to make sense of her murder. Sigourney Weaver — whose 1988 portrayal of Fossey in Gorillas in the Mist launched the species’ plight onto an international stage — narrates the primatologist’s point of view. Interviews with Fossey’s research assistants and naturalists like David Attenborough raise questions that the documentary tries to answer. Don’t mistake me. Murder mystery aside, the film still shows in great detail how Fossey’s 18-year endeavors at Karisoke — the first long-term study of gorillas — shifted the human perspective on these primates. Fossey, in many ways, suffered from the pioneer’s dilemma. Trailblazers create change, and change is often not welcome. 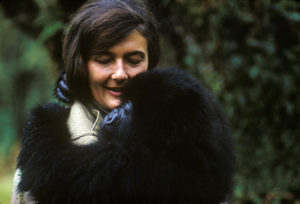 Fossey helped develop the technique for gorilla habituation, a tactic she used to learn and mimic the social cues of the apes to gain their acceptance. Her research exposed how gorillas communicate, both vocally and non-vocally, and also that male and female gorillas share strong emotional bonds. If one partner dies, the other will abandon the group. By embedding with gorillas, Fossey found that gorillas possess a gentle nature, though they appear physically intimidating. While Fossey’s love of the gorillas is evident in the documentary, the film also explores how her long hours in the jungle complicated her relationships with others. The film, on more than one occasion, hints at her troubles with social isolation and alcohol abuse. 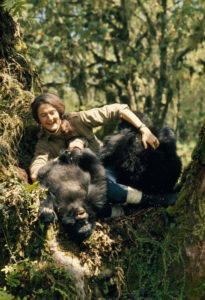 Fossey was also a longtime vocal critic of poaching and created the concept of active conservation, whereby she and her team would destroy traps, confront hunters and dissuade ranchers from using forest land. But she was also accused of torturing one poacher and kidnapping a child from a village in the name of conservation. Fossey, in many ways, suffered from the pioneer’s dilemma. Trailblazers create change, and change is often not welcome. The documentary portrays how the Rwandan officials branded Fossey as an overstepping American outsider at the time. Today, in contrast, the nation leads efforts in gorilla conservation, thanks in large part to her work. “Dian Fossey: Secrets in the Mist” walks through many murder suspects, including government officials, poachers and one of Fossey’s graduate students — but I won’t spoil the final verdict. With more than 40 film credits to her name, Jane Goodall is no stranger to the camera. So rather than recount her illustrious life, the documentary, simply called “Jane,” creates an immersive experience, dropping you into early 1960s Gombe, where you walk alongside Goodall as she offers insights into chimpanzee behavior. The movie accomplishes this feat by leaning on 140 hours of never-before-seen footage shot by photographer Hugo van Lawick, who National Geographic sent to document Goodall in 1962. Most of this footage, buried in a storage locker, had not been viewed in nearly half a century, “Jane” producer Bryan Burk said. Director Brett Morgen and a film editor spent months cataloguing the footage. Goodall named the chimps that she studied, but none of the footage included this documentation. So Morgen and company used old pictures to painstakingly identify the members of Goodall’s chimp family, from David Greybeard to Flo. “When I showed the film to Jane, I literally thought she would say all of our notes were wrong. But she didn’t,” Burk said. But all of van Lawick’s footage lacked sound, so the team turned to Bernie Krause, a musician and naturalist who has traveled the world recording noises in natural environments, including a stop with Jane Goodall in Gombe. 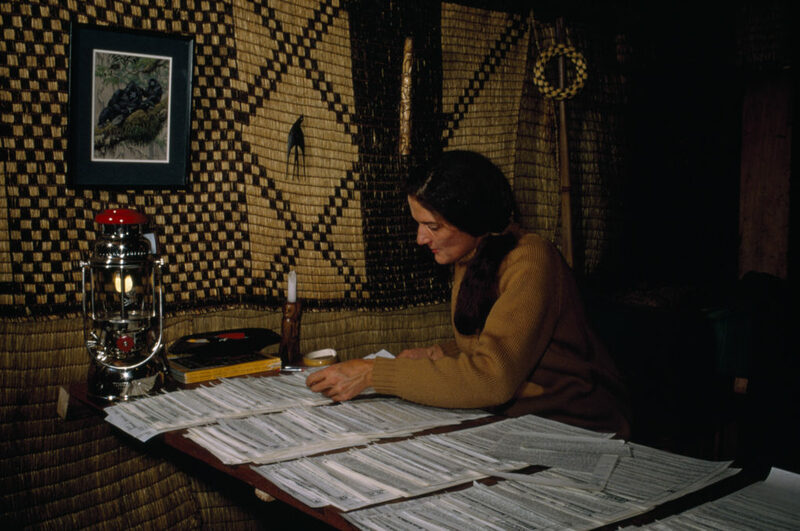 Krause’s recordings create the feelings of trouncing around the jungle along with Jane. She and van Lawick eventually fell in love, married and had a child named Grub. The film mixes intimate shots of weddings and honeymoons with swimming trips to African lakes. A female chimpanzee under study — Flo — had babies, and the movie charts how developments in Goodall’s life often paralleled ones with this primate matriarch. 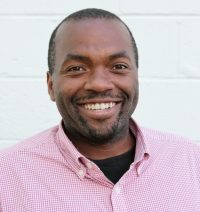 “In watching this footage, there was a definite connection between [Goodall] raising Grub and watching Flo raise her child,” Burk said. “And it was a natural thing that started coming together” while editing the film. NewsHour Weekend chats with Jane Goodall and director Brett Morgen. Goodall describes the strong attachments of motherhood, both in reference to herself and Flo’s behavior, but also the convoluted feelings associated with letting go. By doing so, the movie walks through Goodall’s biggest discovery: that chimps form complex societies, filled with toolmaking, love, compassion and even warfare between rival groups. After hearing Goodall describe David Greybeard as “handsome” during a screening, Burk realized these impressions of human qualities stick with her to this day. The first installment of “Dian Fossey: Secrets in the Mist” aired Wednesday, Dec. 6 on the National Geographic Channel, but you can also view it online. Episodes two and three will air Dec. 13 and Dec. 17. “Jane” debuted at the Toronto Film Festival in September, but is currently screening in limited theaters around the U.S. and Canada.